I went back to Bowles and Gintis to compare their results to those of Greg Clark that I posted about recently. The largest correlation reported by Bowles and Gintis for intergenerational earnings is 0.65, obtained when fathers' and sons' earnings are averaged over multiyear periods, whereas Clark finds a (roughly) 0.7 -- 0.8 correlation between parental and children's social and economic status. Clark was studying the past 200 years, using rare surnames, whereas Bowles and Gintis concentrated on the modern era. Even the lower value of 0.42 (more typical of results cited by Bowles and Gintis) implies some persistent stratification, as shown in the figure below. We have located 65 estimates of the normalized regression coefﬁcient of a test score in an earnings equation in 24 different studies of U.S. data over a period of three decades. Our meta-analysis of these studies is presented in Bowles, Gintis, and Osborne (2002a). The mean of these estimates is 0.15, indicating that a standard deviation change in the cognitive score, holding constant the remaining variables (including schooling), changes the natural logarithm of earnings by about one-seventh of a standard deviation. By contrast, the mean value of the normalized regression coefﬁcient of years of schooling in the same equation predicting the natural log of earnings in these studies is 0.22, suggesting a somewhat larger independent effect of schooling. We checked to see if these results were dependent on the weight of overrepresented authors, the type of cognitive test used, at what age the test was taken and other differences among the studies and found no signiﬁcant effects. An estimate of the causal impact of childhood IQ on years of schooling (also normalized) is 0.53 (Winship and Korenman 1999). A rough estimate of the direct and indirect effect of IQ on earnings, call it b, is then b = 0.15+(0.53)(0.22) = 0.266. ... Using the values estimated above, we see that the contribution of genetic inheritance of IQ to the intergenerational transmission of income is (h2 (1+m)/2)(0.266)^2 = .035(1 + m) h2. 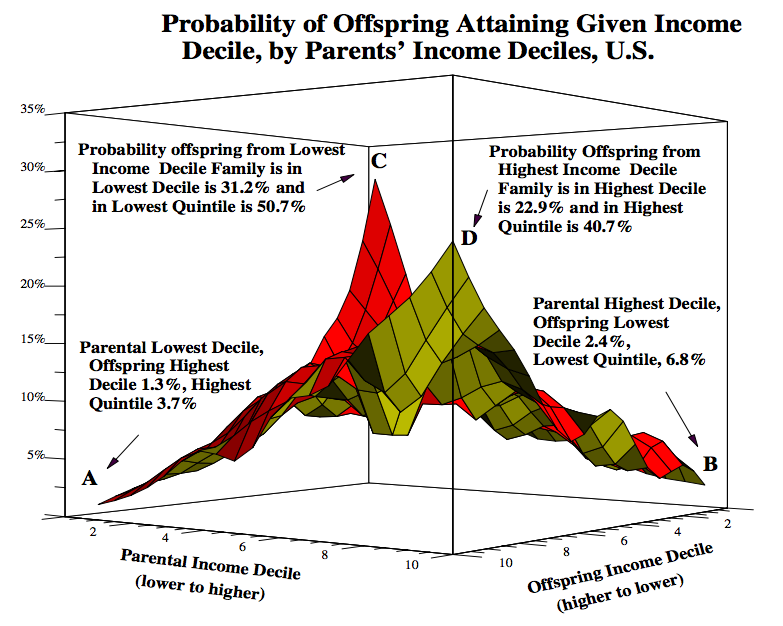 If the heritability [h2] of IQ were 0.5 and the degree of assortation, m, were 0.2 (both reasonable, if only ball park estimates) and the genetic inheritance of IQ were the only mechanism accounting for intergenerational income transmission,then the intergenerational correlation would be 0.01, or roughly two percent the observed intergenerational correlation. Note the conclusion that the contribution of genetic inheritance of IQ is negligible is not the result of any assumptions concerning assortative mating or the heritability of IQ: the IQ genotype of parents could be perfectly correlated and the heritability of IQ 100 per cent without appreciably changing the qualitative conclusions. The estimate results from the fact that IQ is just not an important enough determinant of economic success. [THESE RESULTS ARE SURPRISING SMALL. I'D GUESS THAT AVG IQ VARIES FROM ABOUT -.5 to -.75 SD AT 10TH PERCENTILE INCOME TO +.5 to +.75 SD (COLLEGE GRADUATES) AT 90TH PERCENTILE INCOME, SO CORRELATION OF PERHAPS 0.3 -- 0.5. I GUESS THE LITERATURE SUPPORTS 0.3. BUT NOTE THAT AVERAGING INCOMES OVER EXTENDED PERIODS (LIKE 10 YEARS) INCREASES THE INTERGENERATIONAL CORRELATION SIGNIFICANTLY (I.E., FROM 0.4 TO .65, PRESUMABLY BY ELIMINATING SOME OF THE NOISE IN THE INCOME MEASUREMENT), SO ONE MIGHT EXPECT THE SAME FOR THE IQ-INCOME CORRELATION. (THE INTERGENERATIONAL STUFF IS COMING FROM SOMEWHERE!) SINCE THE IQ-INCOME CORRELATION ENTERS SQUARED, INCREASING IT HAS A BIG EFFECT. In the Terman study of gifted individuals, additional IQ above 135 or so had a relatively small effect on lifetime earnings: an increase of 15-20% for an additional SD of IQ. In contrast, personality factors such as Conscientiousness and Extraversion were strongly correlated with increased earnings (see figures at link above): an increase of about 50% from 10th to 90th percentile was observed. Note that personality factors are heritable, with h2 roughly 0.5 or so. These findings, which come from a high IQ sample and are thus affected by restriction of range, are nevertheless suggestive of effect sizes in the overall population. For more discussion of Bowles and Gintis, see GNXP 2011 and GNXP 2008. A numerical error in B&G is noted, but it doesn't change the qualitative conclusions. I think one of the most interesting studies psychology could do would be to take a bunch of traits known to influence income, for example your combination of IQ and personality measures, and see how much of the variance in income could be explained by them. A similar study could be done for the dating game: take height, income, physical attractiveness ratings, symmetry, personality measures, IQ, etc. and see how much of the variance in # and attractiveness of mates is accounted for. It seems like Psychology could potentially answer a bunch of questions that people think about and argue over all the time. But to my knowledge no study has been done to see how much we can predict with all of our measures combined. RE: dating, OK Cupid may have done something like this. I agree, it's a feasible project and the outcome would be quite interesting. What about NFL combine or college stats as predictors of NBA/NFL outcomes? I'm sure that's been looked over pretty carefully. Interesting post. I'll mention that I think it's interesting that a lot really can be judged by a person's face. It makes sense that people would have evolved an ability to make snap judgement about others. Physiognomy is not a pseudoscience like some say, and like many things that were known in the past, they have to be relearned. Don't discount the role of plain old cash inheritances, especially in facilitating creative and intellectual careers. I've often wondered how accurately psychologists can distinguish IQ and Conscientiousness. People will score higher on an IQ test because they conscientiously work hard at it, and people will score higher on a Conscientiousness test if they are smart enough to figure out what kind of answers would look good. The big question that would sell a lot of books is what can parents do for their kids after they are born. For example, what's the long run ROI on orthodontia? I think Bowles and Gintis are careful to distinguish income and earnings. The former could come partially from inheritance. But you're right that having a cushion to fall back on also helps in starting a career, and hence boosts earnings as well. 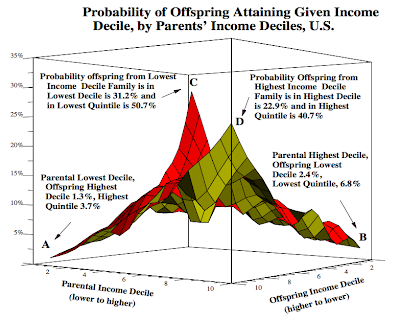 If...the genetic inheritance of IQ were the only mechanism accounting for intergenerational income transmission,then the intergenerational correlation would be 0.01, or roughly two percent the observed intergenerational correlation...The estimate results from the fact that IQ is just not an important enough determinant of economic success. Offhand, this seems like a devastating blow to the widespread description of the new Charles Murray book and its supposed thesis (I haven't read the book itself). Indeed, a commenter on Steve Sailer's blogsite pointed to data showing that the college majors of the One Percent indicated a weak correlation to likely intelligence, with physics and math majors being substantially under-represented. These critiques all seem pretty plausible to me. Success in a social system run by a highly extractive elite would tend to select for extractive tendencies, which are probably only loosely correlated with mental ability. And we would expect to also see a major role for nepotism, corruption, and similar forces. One shouldn't underestimate the importance of social networks in maintaining income across the generations. For example, if a family has a sufficient social status for its daughters to marry millionaires in Texas and Louisiana over the generations, it doesn't matter what the academic achievements of these individuals are. Why do people do genealogy anyway? Having a cushion also helps in enabling long term thinking (this overlaps with what both of you are saying). I believe one of the biggest perils of being poor is being "forced" into making decisions based on short term outcomes. (a trivial example is not being able to reduce the price of staples by buying in bulk, your example of accepting reduced present income when starting some careers is better) I think this also shows up in ways that do not appear in income statistics. I can be more aggressive in my risk taking if I believe people will help me if I fail. Another important example, which has grown enormously over the past generation, is the role of unpaid "internships" as gateways to many elite or highly-desirable professions. Obviously, individuals from wealthy families can afford such timewise-capital investments much more than young people from humbler backgrounds, especially since the locations are usually in some of the most expensive cities such as NYC or DC. The fact that selection for these crucial first-rungs on the elite ladder are always highly-subjective and influenced by nepotism or social networks compounds the problem. The American newspapers have made much of China's new top leader being from a "princeling" background, whose upward climb was enabled by the prestige of his father, an important military leader of the revolution. But my impression is that this situation is becoming just as widespread in today's America, or perhaps even more so. There's an upcoming paper about a Finnish twin study reportedly showing that the heritability of lifetime income in Finland is 50% for men and 40% for women. I don't know how much intelligence accounts for that though. I think the correlation between IQ and income is underestimated in a lot of these studies because as Steve H. implies income is a highly unreliable measure varying enormously from year to year, so you really have to average it over time or correct the correlation for unreliability. Also how is income defined? Is it salary, capital gains, insurance, law suit settlements etc? Do we focus on individual income or household income? Declared income or undeclared income? How honest and accurate are people in reporting their incomes? Also, when we control for schooling, we severely restrict the range of both IQ and income, thus supressing the correlation. Also income and IQ have very different distributions which mathematically supressed the correlation. I suppose taking the natural logarithm is an attempt to deal with this. Does a 5’6” guy with a weak chin, an asymmetrical face, and an IQ of 85 from a working class background really want to know the answer to this? I think he might just prefer to repeat “all men are created equal” a lot. I think the cushion to fall back on is huge. The wife of a friend has been through at least half a dozen business ideas that have lost money or at best made little more than minimum wage once her time was accounted for. Now she has finally found one that looks like it will make her a substantial return. Without her husband’s substantial 6 figure income to power through those first failures would this one have happened? When you know mommy & daddy will always pick you back up when you fail it is a lot easier to take the risk. our society gets more fair in terms of environments, outcomes will become more unequal due to genetic stratification based on merit. The idea that equalizing environments increases the importance of genes is true, in fact it's mathematically provable. The flaw in thesis is that a meritocracy-- at least as most people imagine it-- is a society in which people are motivated by many things, not just money. And unless there's a draconian rule that you need to pursue money above all else, people will not be perfectly sorted by income according to genes for talent. No, in a 100% meritocracy (which by definition would require a socialist welfare state) people would sort themselves according to their interests a great deal, becoming great painters or contributors to open source projects or what have you. That's not to say that the Meritocracy Thesis doesn't have some truth to it. Just that we shouldn't assume that it follows logically from behavior genetics. The same goes for Conscientousness. It might be assumed that less conscientious people make less money because they aren't capable of working long hours and taking orders. No doubt that's somewhat true.. But perhaps less conscientious people are also more "type B" personalities, who enjoy life more outside of the rat race and are less interested in the pursuit of money. Said dearth of meritocracy (as a proxy for the prevalence of extractive/nepotist elitism) would be an interestingly objective measurement of leadership health. This meritocratic measurement might only be valuable for those who believe that high-g scientific literates *should* tend to be running things. But I think that this position is more common than many suppose, and that it (and by extension, the weight of this measurement of leadership health) will continue to gain currency. Widespread cynicism about the "idiocy of the mob" regardless. Most people don't get rich by pursuing money. They get rich by being good at something (anything) that has value to others. That's why money is a good reflection of merit. If you follow the posts on this blog, a common theme is that finance has been the way to go to get money in the last couple of decades.. rather than going into fields like science that are more beneficial to the world at large. Not to get into an economics argument, but rewarding and punishing externalities appropriately is known to be a major issue in free market economies, among others. Greg Clark: Are there ruling classes?